At 16 years and 42 days, McIlroy was fully six months younger than his fellow Ulsterman Ronan Rafferty, who turned 16 in January 1980 and went on to beat Michael Bannon by 8 and 7 in the ‘Close’ final at Royal County Down the following August. By a strange twist of fate, Bannon is now the head professional at Bangor Golf Club and has been coaching McIlroy since the youngster was just six years old. And he would surely have been proud of his pupil’s latest victory on the pristine fairways of Westport Golf Club, a victory which marks him out as one of the most outstanding teenage talents in European and world golf. McIlroy qualified comfortably for the matchplay stages with a brace of one over par rounds of 74 and then accounted for Greg Massey of Hermitage, Balbriggan’s Robert Cannon, Portmarnock’s Michael Brett, leading qualifier Sean McTernan and Connor Mallon of Banbridge before defeating 32-year-old McCormack in a compelling final. Only Brett and McTernan managed to take him to the 18th, but the latter did at least have the satisfaction of carding a fabulous, 12-under-par round of 61 on the first day of strokeplay qualifying. 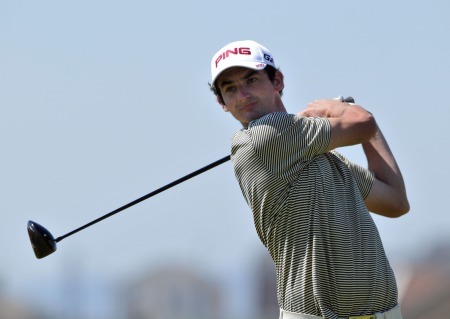 A graduate of the University of Toledo, 24-year-old McTernan has been one of the most consistent performers on the amateur scene for the past few years, finishing second in the Irish Amateur Open and East of Ireland championship last season alone. It would appear to be only a matter of time before the County Sligo man breaks his championship duck, and on the evidence of his remarkable 12 under par qualifying round, it is more likely to come in a strokeplay rather than a matchplay event. Defending champion and recently crowned Amateur champion Brian McElhinney of North West, had set the early pace and established a new course record with a five under par 68 before McTernan tore that record to shreds by playing the last five holes in six under par. The Rosses Point native birdied the fourth and fifth, holed from 40 feet at the sixth and two putted the par five seventh to turn in four under par 32. He then holed from inside three feet at the 10th and from inside four feet at the 11th to get to six under before resuming his birdie fest with three consecutive birdies from the 14th to the 16th, holing putts of no more than eight feet each time. The highlight of his round came at the short, par-four 17th where he holed his second shot with a lob wedge from at least 50 yards for an eagle two to get to 11 under. With eight fours, seven threes and two twos on his card, he was determined to keep a five off his card at the last, and after a perfect drive, he rifled a two-iron into the semi-rough short of the green, chipped four and half feet past the hole and triumphantly sank his 26th putt of the day for a 61. "I am just in shock," he said afterwards. "It was just one of those days. I have had a few days where I started off really well, but nothing like this. It got ridiculous at one stage. McTernan would eventually lead the qualifiers on 11 under par after a second round 74 gave him a four-shot cushion over last year’s beaten finalist Michael McGeady with Portmarnock’s David Kelleher (68-74) and McElhinney three shots further back. The cut fell at six over par 152 but only Edenderry’s Ger Hall made it through on that mark, leaving seven men disappointed including 2003 champion Mark O’Sullivan of Galway, who paid dearly for his second round 77. After opening with an 80, McCormack gave fair warning of his true form when he produced one of the rounds of the day, a two under par 71, to qualify with two strokes to spare. The first round of matchplay combat brought its share of surprises and by day’s end, the third round draw did not contain the names of defending champion McElhinney or internationals McGeady, Darren Crowe, Richard Kilpatrick and Mark Campbell. McElhinney exited in the first round to Hall by 2 and 1, with much of the damage self-inflicted by 38 putts and a doggedly competitive Hall, who would eventually fall to Birr’s Michael Horan in the second round. Their defeats shifted the onus of expectation onto the shoulders of players such as McTernan, Mallow’s Mervyn Owens and Rory Leonard of Banbridge with young guns such as 21-year-old Aengus McAllister from Portmarnock, 18 year-old Nicky Grant of Clandeboye and 16-year-old McIlroy also looking good. Grant did not drop a shot or lose a hole as he beat Limerick’s Dermot Morris by 7 and 6 and John Turner of Royal Portrush by 8 and 7 while McIlroy beat Massey and Cannon to set up a fascinating duel with a rejuvenated Michael Brett of Portmarnock in the third round. Lee Valley’s Keith Crowley, a 19-year-old youth international who only took up the game five years ago, took a major scalp when he defeated Kilpatrick by 2 and 1. And there was also a surprise in the defeat of last year’s beaten finalist and East of Ireland runner-up McGeady at the hands of eventual finalist McCormack in round two. McGeady had to hit a glorious four-iron into the par five 18th to see off 17 year old Niall Kearney of Royal Dublin in the first round, but he came unstuck against the experienced McCormack, who laid the foundations of his 2 and 1 victory with impressive birdies at the the difficult 12th and 13th. The fourth day of the Championship brought still more excitement as McIlroy recorded a thrilling one-hole victory over McTernan in a quarter-final clash that was worthy of the final itself. McTernan had accounted for Rory Leonard and McIlroy for Brett, both by the margin of one hole, in their third round matches to set up a mouth-watering quarter-final confrontation that did not disappoint. The Sligo man won the first two holes but he was pegged back to level as McIlroy reduced the par five fourth to a drive, wedge and two foot putt for eagle and then took the long seventh with a birdie to level matters. Little over an hour later, McTernan found himself four down with five to play as McIlroy birdied the par-three ninth to go one up, halved the 10th in birdies and then won the 11th and par-three 12th in par. McTernan needed something special at the index one 13th to get back into the match but was beaten to the punch by McIlroy, who hit a glorious three-iron from 190 yards to 12 feet and holed the putt to stretch his lead to four holes. McTernan fought back, however, to win the 14th in par and the 16th and 17th with birdies but had no answer to McIlroy's birdie on the downwind, 560-yard 18th. After both players had hit perfect drives, McTernan's magnificent approach finished pin high, just off the green but McIlroy responded with a 190-yard seven-iron to the heart of the green and two putted for birdie before McTernan's eagle chip came up just short. While all this was going on Doran, McCormack and McAllister had made their way slowly but surely into the last four. McAllister always had the upper hand against an out of sorts Owens of Mallow, winning by one hole while McCormack’s long game was just too good for West Waterford’s Mark Shanahan in the other quarter-final. Doran, meanwhile, beat Birr's Michael Horan by 5 and 3 to set up a semi-final meeting with McIlroy but he was laid low by a stomach bug over night and got just four hours sleep. What might have happened if Doran had been fully fit we will never know as the eventual champion birdied the first two holes and was seven under after 11 and six under par to Doran’s two under when they shook hands on the 15th green. Playing out of Galway this season, McCormack played brilliantly to beat McAllister by 3 and 2 in the other semi-final but was outplayed in the decider where he went one up after five but lost four holes in a row from the seventh and never fully recovered. After driving out of bounds to hand the youngster the seventh on a plate, McCormack lost the next three holes as the youngster holed vital par putts for wins at the eighth and ninth to turn two up and then stgretched his lead to three holes at the par-five 10th where Cormack pulled his drive into lateral hazard and lost the hole to McIlroy's birdie. 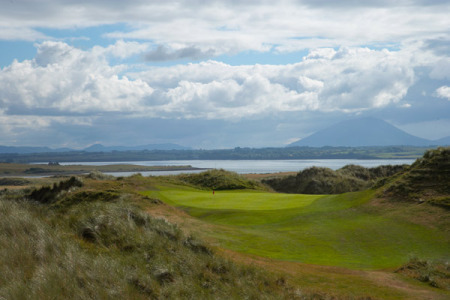 The Galway based printer won the 11th in par to cut the deficit to two holes but hit a poor tee shot to lose the par three 12th to a par, won the 13th after McIlroy three putted but then lost the 14th after another poor tee shot left him with an impossible recovery from greenside sand. Three up with four to play, McIlroy appeared to open the door for McCormack when he lost a contact lens on the 15th fairway and knocked his third shot into a deep bunker left of the green as he struggled with blurred vision. But the youngster gathered himself to float a gorgeous bunker shot to a couple of inches for a half in five and leave McCormack needing to win the next three holes to force sudden death. He failed with a 15 footer for birdie at the 16th, however, and McIlroy calmly rolled his 12-foot effort up stone dead to take the title by 3 and 2. With this victory, the mantelpiece at the McIlroy household now bears the weight of five trophies - the 2004 Ulster Boys, Irish Boys and Irish Youths Championships as well as the 2005 West of Ireland and Irish Close Championships. In winning the title, McIlroy matched the feat of Great Britain and Ireland Walker Cup skipper Garth McGimpsey, who as the last man to win the West and Close double in 1988. "It's such an achievement for me,” said McIlroy afterwards. “To win one senior championship is good, but to win two in a year is unbelievable. McCormack can be proud of his performance at Westport and will surely be back for more. The problem is that McIlroy is also likely to be around for a few years yet and on the evidence of what we have seen so far, that mantelpiece may need reinforcement. M McGeady (North West) bt N Kearney (Royal Dublin) 1 h.
E McCormack (Galway) bt M McGeady (North West) 2/1. E McCormack (Galway) bt J Waldron (Muskerry) 5/4. E McCormack (Galway) bt M Shanahan (West Waterford) 1 hole. E McCormack (Galway) bt A McAllister (Portmarnock) 3 and 2. R McIlroy (Holywood) bt E McCormack (Galway) 3/2. Enniscrone left its scars on the field as just 16 players broke 80 in the first strokeplay qualifying round of the Irish Amateur Close Championship. Enniscrone is proving to be a tough test.High winds wreaked havoc on the field but Gourley played the front nine in one under par 36 and came home in three over 39 as he mixed birdies at the second, eighth, 11th and 16th holes with bogeys at the seventh and 18th and double bogeys at the 12th and 15th. Sinclair hit the turn in three over par 40 but came home in level par 35 to finish a shot better than recently crowned East of Ireland champion Paul Cutler from Portstewart and Lahinch's Stephen Loftus. Paul Cutler is out on his own at Shannon. But there’s always someone lurking ….Portstewart’s Paul Cutler will be bidding to follow in the footsteps on current world number six Rory McIlroy when he takes a one-stroke lead into the final two rounds of the Golfsure Irish Amateur Close Championship at Shannon today. The 22-year old Walker Cup hopeful carded a one over par 73 on another blustery day to top the leaderboard on two under par and keep alive his hopes of completing a rare West of Ireland - Irish Close double last achieved by McIlroy at the European Club in 2006. Paul Cutler plays his approach to the 17th in the third round.The old biblical adage that says that the good and the just are always rewarded rang true at Shannon as Portstewart’s Paul Cutler bravely birdied two of his last three holes to win the first strokeplay staging of the Golfsure sponsored Irish Amateur Close Championship by two shots. Chris Selfridge extended his overnight lead to three strokes in the Irish Amateur Close at Royal Portrush. Picture by Pat CashmanOvernight leader Chris Selfridge insists he will not be putting any pressure on himself despite adding a 72 to his opening 66 to take a three-stroke lead into Sunday’s final 36 holes at the Golfsure sponsored Irish Amateur Close Championship at a sun-splashed Royal Portrush. Cormac Sharvin (Ardglass) who shot a 66 to be leading qualifier at the AIG sponsored Irish Amateur Close Championship at Connemara Golf Club. 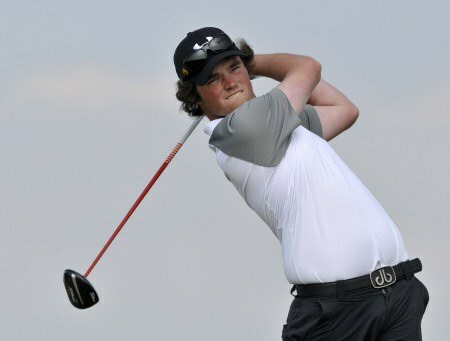 Picture by Pat Cashman Ardglass’ Cormac Sharvin claimed the coveted Silver Medal when he added a six under par 66 to his opening 70 to top the qualifiers in the AIG sponsored Irish Amateur Close Championship at Connemara Golf Club.